1 of 4 In a small saucepan, stir together sugar and 1/2 cup water. Bring to a simmer and stir until sugar is dissolved. Cool and stir in lemon juice. 2 of 4 Place cantaloupe in a food processor; add one-third of the simple syrup. Process until smooth. 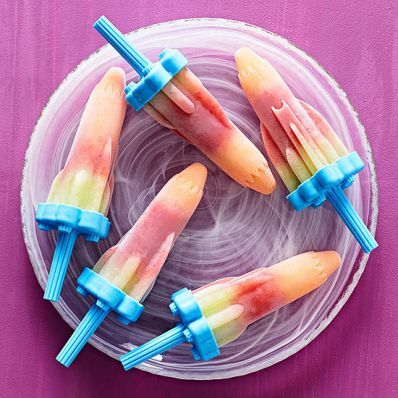 Spoon 1 1/2 tbsp of the puree into 12 rocket pop molds (for more information, see page 150) and freeze for 1 hour or until top starts to set. 3 of 4 Process watermelon with another third of the simple syrup. Spoon 1 1/2 tbsp of the puree into each rocket pop mold. Freeze for 1 hour. Repeat with honeydew melon and remaining third of the simple syrup. Insert handles into each mold and freeze overnight. 4 of 4 To serve, run under warm water for a few seconds and slide each pop out of its mold. Per Serving: 1 g fiber, 1 g pro., 0 g sat. fat, 15 g carb., 13 mg sodium, 0 g Fat, total, 0 mg chol., 53 kcal cal.